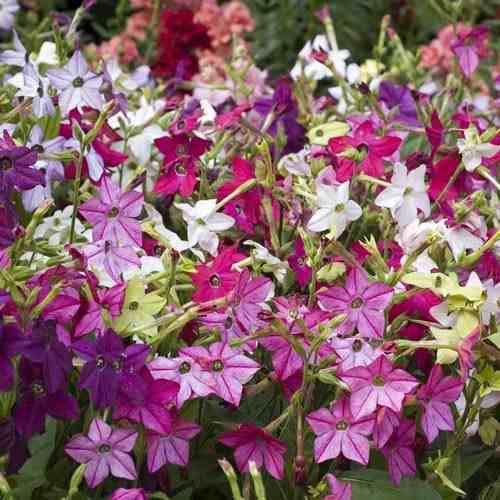 I have trying out some Nicotiana that had a good colour range and which would compliment the other two varieties of Nicotiana I already stock. In the end it wasn’t a difficult decision. I knew ‘Sensation’ was popular with florists who can get hold of it (It doesn’t travel well from overseas) and it is a simple and unfussy plant to grow from seed. Not only is it jaw droppingly pretty it also has a delightful evening fragrance which it uses to attract moths which pollinate it. Sow undercover in March/April. I sow mine on the 1st April…sow the tiny seeds on the surface and keep moist. Sow SUPER THINLY as you will get hundreds of seedlings otherwise.